When I saw Ina Garten serving roasted lemons along with her delicious roast chicken, I thought, “I can do that with my lemons!” Ina is the master, but I believe most lemons might taste too bitter to serve. I think the mighty Meyer wins again, at least in our family. 1. Remove inner “parts” and pull off large glob of fat near opening of the cavity. Wash and dry the chicken, salt and pepper inside cavity. Place the halved garlic head and one lemon, also cut in half, inside the chicken. Tie legs together with butcher’s string and fold wings under. Stick thyme bouquet half in/half out of chicken cavity. 2. Quarter remaining three lemons and place in roasting pan close to chicken. Rub some olive oil over top of chicken and toss lemons with rest of oil. Salt and pepper chicken and lemons. Add wine to pan. 3. Roast at 375 degrees for 2 hours. Allow chicken to rest, covered, while you make the sauce (recipe below). 2. Mash the softened butter into the flour and whisk into the pan juices which are simmering. Sauce will thicken. Add cream and cognac. Taste and correct seasoning. 3. Remove and discard thyme bouquet. Carve and serve chicken on a warmed platter, along with the roasted lemons. Drizzle sauce over all or serve separately in a warmed pitcher. This sounds so bright and spring – like. 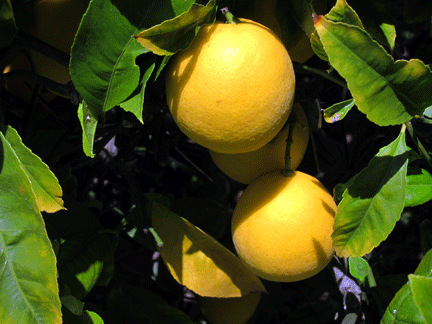 I love the idea of roasting and eating the lemons. Our tree is finally producing! Thanks, Lynda – the sweetness of the Meyers really makes them edible! Yum! 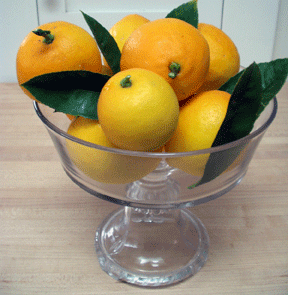 I have never had meyer lemons but I really want to give them a try. I just have to find some! Wish I could give you a handful from our tree!